All three are good games worthy of recognition even if I didn’t vote for any of them. My three choices of Love Letter, Lords of Waterdeep and Snowdonia came in 4th, 5th and 6th respectively. Congratulations to the winners and thanks to Larry Levy for running it as usual. I’m pretty sure which games I’m voting for – two are very easy, the third just needs a bit more thought. I’ll let you know what I’ve chosen once the results are announced. I’ve got 40 (count ’em, 40) games up for sale on ebay at the moment. The auctions end on 19th June and there are some interesting items: Pueblo, 1st & Goal, Perikles, A La Carte, Secret of Monte Cristo, Elasund: The First CityÂ and Time’s Up to name but a few. The full list of games can be seen here. Happy bidding! Played Little Prince for the first time this evening and what a cracking game it is. Slightly different two-player which is how I played (with Rebecca) but I thought it a very nice interactive puzzle game. Each player is constructing a planet of twelve tiles with an additional four tiles at the corners of the 4×4 grid showing the scoring criteria for your planet. Each round, the active player draws tiles equal to the number of players, chooses one and decides who chooses next. The last player has no choice but becomes the active player for the next round. After all 16 tiles have been placed in the grid, you score and, whoever has the most points, wins. It doesn’t sound overly different but I see it playing very tactically, with gamers selecting tiles (and the next player to play)Â just as muchÂ with a view of stuffing other players as much as helping themselves. The two-player game has the active player picking three tiles, displaying two face up and the other face down, so the other player picks one and the active player takes one of the two remaining, discarding the final tile. Otherwise, the game plays the same, Very good and I’m very keen to play again. It’s time again for the Spielfrieks group to vote for the best games from the last 12 months. The first stage is to nominate ten from a list of the 200 most notable titles released in 2012. In my first pass through the list, I didn’t even reach ten games that were definites. There were a few that ended up close to making the final ten (Divinare, Agricola: All Creatures Big & Small, Morels, Escape: Curse of the Temple) but my ten picks ended up being: Africana, Keyflower, Las Vegas, Lords of Waterdeep, Love Letter, Palaces of Carrara, Pax Porfiriana, Snowdonia, Targi and Tzolkin: The Mayan Calendar. I don’t back very much on Kickstarter as I’m not really interested in the “special extras” offered to Kickstarter backers. I did back Escape: Curse of the Temple which I was reasonably pleased with when it eventually turned up but part of that order (The Adventurer pack)Â is still to be delivered even though it was originally due in September 2012, I think. I am also awaiting Dungeon Roll, which I ordered on a whim, and this is due for delivery in August. However, I have just backed Euphoria: Build a Better Dystopia, perhaps again lured by the hype, but this one does look interesting and, importantly, doesn’t shove an extra $15-$20 on for delivery to Europe, which I find pushes most of the campaigns beyond my view of reasonable value (such as the Snowdonia reprint). Anyway, this one is promised before Christmas and the campaign has slightly exceeded its $15,000 target (currently $198,000 pledged with four days still to go). You can see more info here on the Kickstarter page. June is obviously a pretty barren month as in 2008 and 2003 I got to play three and two games in each month respectively. 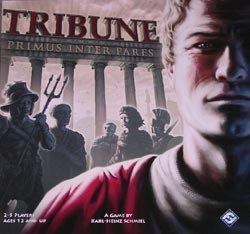 Tribune is a game that I really enjoyed but didn’t go over too well the first time we played it as it seemed to finish really quickly and people got caught out by that. 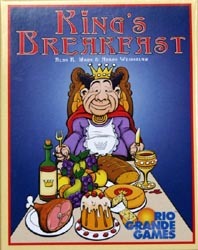 King’s Breakfast is a fun card game from Alan Moon where you’re trying to have a good breakfast but without eating quite as much as the King. 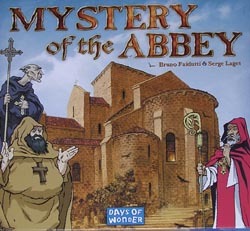 June 1998 wasn’t quite so barren and it was the first time I got to play Bruno Faidutti’s excellent vow of silence game, Mystery of the Abbey. Five years earlier, June 2003 saw me try a couple of interesting race games. Traber Derby Spiel was a precursor to Formula De but based on pony trap racing. 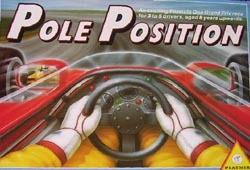 Pole Position, however, is a wonderful game of negotiating an uncertain race track with lots of second-guessing what other players are going to do. Two deliveries arrived today. 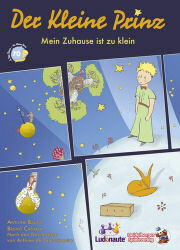 One from Germany brought dice games Jackal & High and Wurfelwurst; mistakenly tipped for the Spiel des Jahres – La Boca; and cute (or evil, depending on your point of view) planet-building game Der Kleine Prinz: Meine Zuhause ist zu Klein. 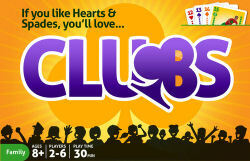 The other delivery was from Funagain Games in the US and contained Clubs, a traditional card game that is similar to Big Two, the Great Dalmuti and Tichu (albeit much simpler).